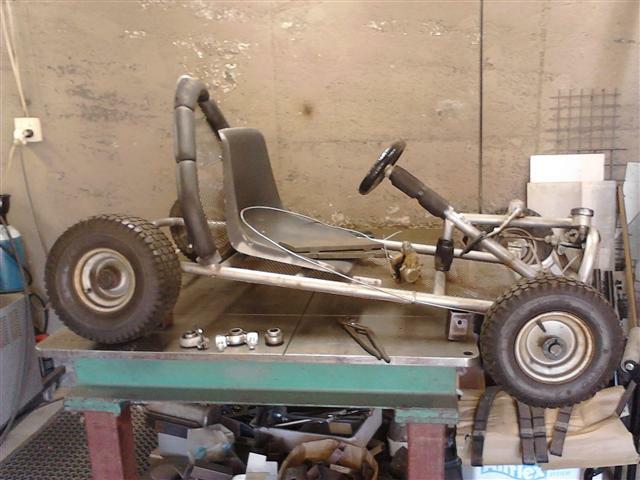 A neighbour and I have gone shares in a home made go-kart, bought at a garage sale for $100. 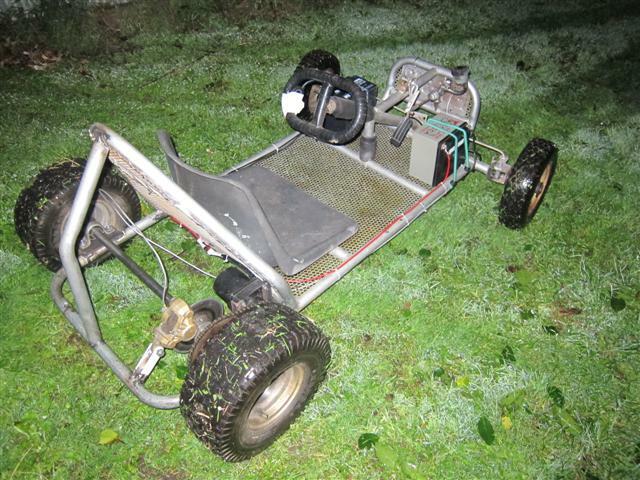 It's big and runs from a clapped-out old lawn mower motor. 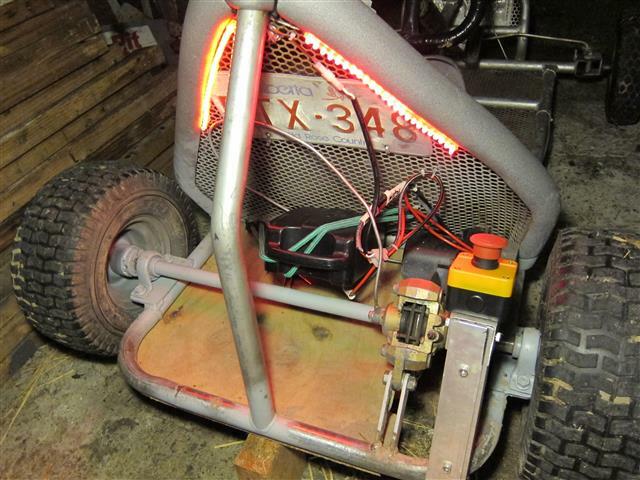 As it happens - I've been doing some work for EVLAb and they have an old electric motor in good condition that should work well. So I plan to convert it over to electric drive. 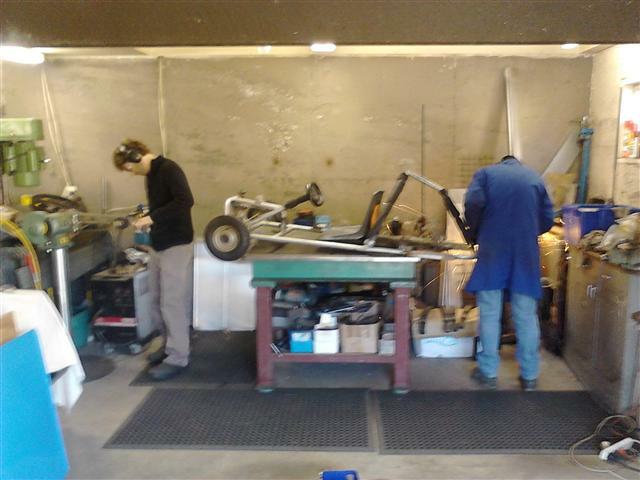 So we spent three hours cutting most of the back end off. We must have cut at least 300 mm off the rear end, and lost about 10 kgs. Next we'll buy some new bits to rebuild the rear axle properly. Another session at Bernie's place. This time we got the rear axle mounted and cut off the rubbish that had been welded to the rear hubs. 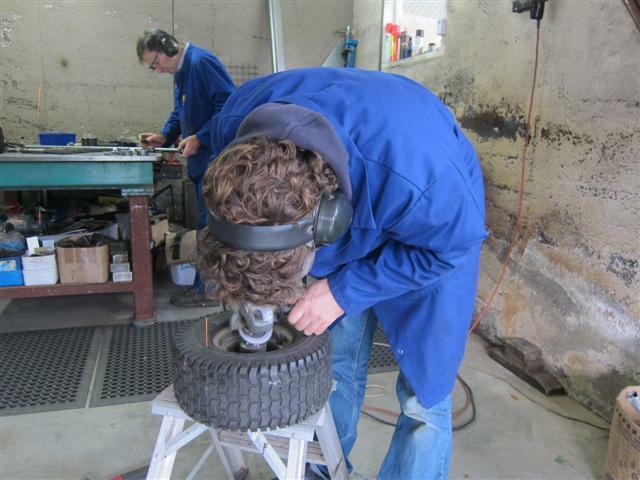 After our last session Bernie reconstructed the rear hubs so that they would fit onto our new axle properly. Now they'll be mounted with grub screws which lock into indents drilled in the axle. Today Bernie and I spent several hours working out how to mount the motor. This involved removing another superfluous cross tube. 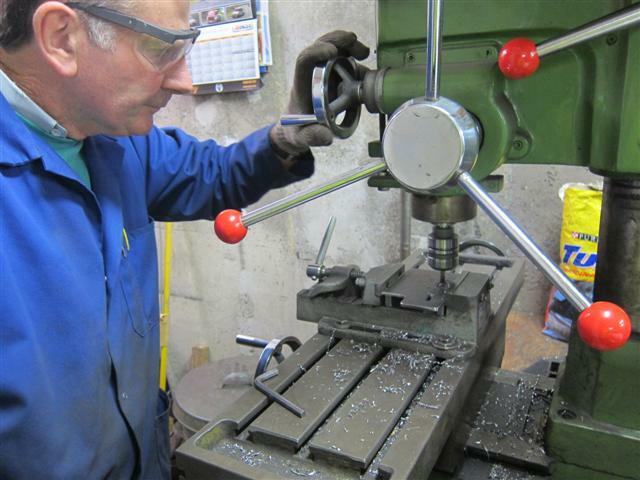 Bernie milling out slots in the base plate that the motor will be mounted on. In our last hour we finished the motor mount and then worked out a very quick mount for the disk brake. 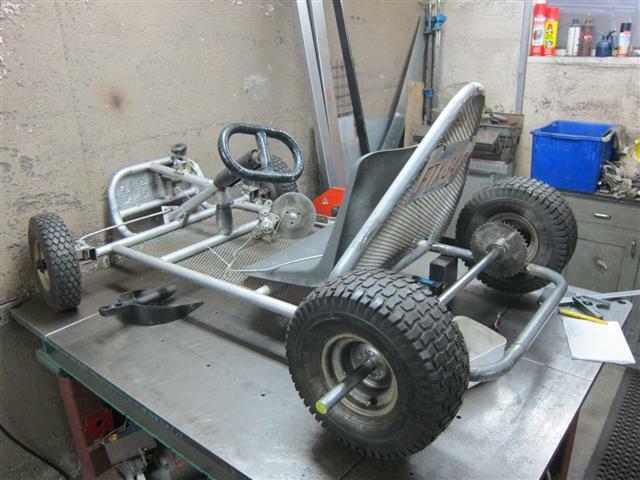 Adam is most excited by the potential for flashing lights on the go-kart... so I'd better add those too. There is a chance we'll have something to test ride next weekend. On the weekend Bernie finished off a lot of nice little details that will eliminate future hassles; like drilling dimples on the axle where the grub screws go. Tonight I quickly strapped the batteries on and connected up the wires to give it a test drive. Success! It actually moves. It's very slow - but that's probably a good thing for 5-year-olds. 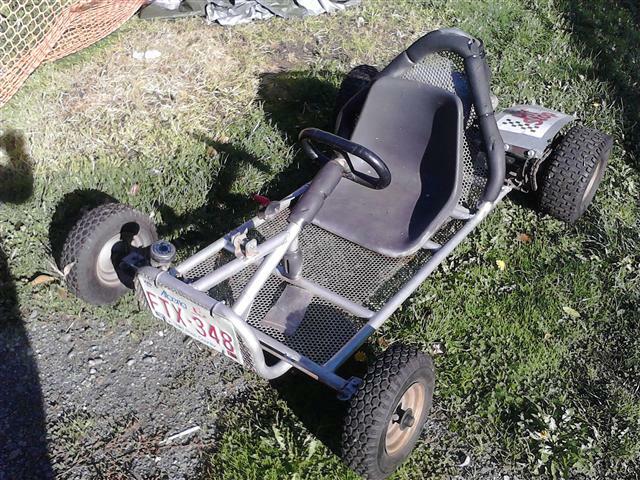 It's got plenty of torque: I drove it up the stop-bank behind our house. The tires work fine on the grass. It's pretty heavy with the current SLA batteries. Add extra bracing to battery mount. Improve the throttle mount (so it doesn't wobble). Change the rear sprocket for a smaller one to make it go faster. Fix the brake so that it doesn't rub. Add a big on/off switch and power on light for the driver. Add flashing police lights for Adam. We had four more kids doing very short test rides this afternoon. At one point there were two kids standing on the back with another driving. I really need to put a cover over the chain to prevent little fingers from getting mangled. Minor tears when some of the kids didn't get a long enough turn. I added a little meter tonight to monitor the battery voltage. I added a chain guard. It should keep little fingers out of the way. The co-owner came round with her two kids and spent at least an hour playing with it. Then another friend came round with their 3-year-old grandchild. The steering is the major performance issue to address. It's currently pretty hard to steer. Right now the top speed as a slow walking pace - which is perfect. I want more speed, but the kids don't need it yet. I need to move the volt meter to somewhere out of the way - on the top of the steering wheel is to easily knocked. 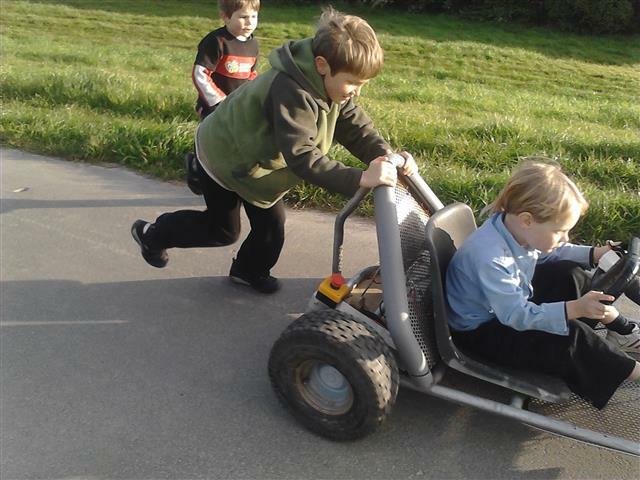 The 3-year-old enjoyed driving it but steering was too hard and he couldn't understand that you needed to let go of the accelerator stop or slow down. So I suspect 3 is just too young. 5-years-old is fine. 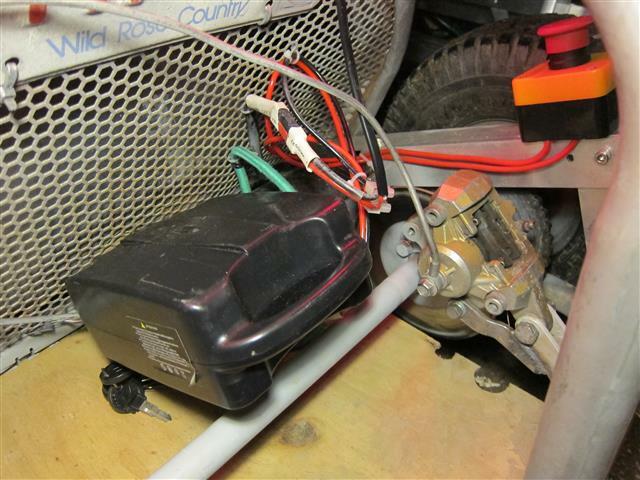 It would be good to have a cut-off switch at the back so an adult can kill the motor easily from the back. They love to stand on the back almost as much as driving it. The batteries were still OK.
One of the kids was hesitant to try it. But after seeing the others enjoy it gave it a go. She was nervous on her first go, then over the course of the hour became progressively more confident. By the end she was keen to jump in and drive. One of the kids had his foot run over - twice. There was tears the first time. He didn't need reminding after the second time. The tires are soft enough for it to not cause an injury. The old bungy cords holding the batteries down seemed to work fine. Adults love driving it too. The Moera community lunch was held today at our local hall. Afterwards I brought the go-kart round to the hall/playground for all the neighbourhood kids to play with. I was really thankful for the low top-speed! The kart was a roaring success. The kids loved it - even the older 10 years olds. I've moved the batteries to the back, behind the seat. This clears the front end ready for rebuilding the steering. Note the addition of an emergency stop button at the back. I thought this would be useful for adults, but it looks like it'll mostly be used by passengers on the back to annoy the driver. I've added rear red LED strips so it's easy to see when the system is on. And the emergency stop button works now too. Falk, Finlay and Officer Adam screaming along at 2kph. "New" Lithium Ion battery installed. The new (2nd hand) battery is much smaller and lighter. I've not yet tested it to see how long it will drive for. It came with a nice slide on/off mount so it's easy to pull out for recharging. New Lithium Ion battery in place. My charger is rated at 29.33 volts, which equates to 4.19 volts per cell (29.33 / 7 = 4.19) which is close to the 4.2 volt standard for Lithium Ion batteries. However reading through How to prolong lithium batteries indicates that if you only charge to 4.1 volts, or even less, you significantly increase battery life. Every 0.1V drop below 4.20V/cell doubles the cycle; the retained capacity drops accordingly. Raising the voltage above 4.20V/cell stresses the battery and compromises safety. So if I only charge the battery to 4 volts (70% capacity) I get four times the battery life. 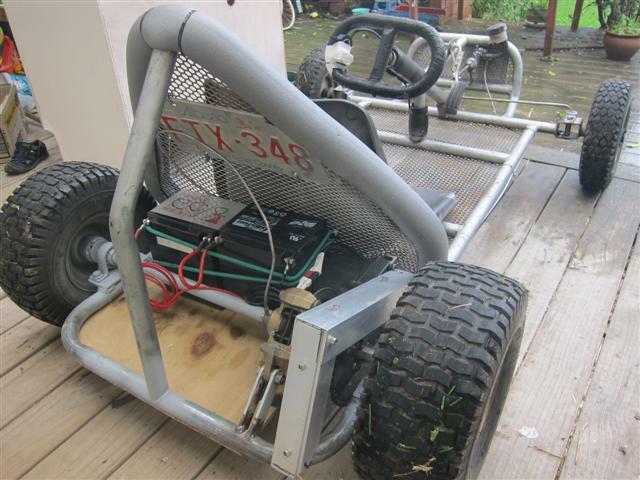 I need to run some test to see if 70% charge will run the go-kart enough to satisfy the kids. The other way to increase battery life is to discharge it less deeply - in other words; not run it dead flat, or even close. Chargers for cellular phones, laptops, tablets and digital cameras bring the Li-ion battery to 4.20V/cell. This allows maximum capacity, because the consumer wants nothing less than optimal runtime. Industry, on the other hand, is more concerned about longevity and may choose lower voltage thresholds. Satellites and electric vehicles are examples where longevity is more important than capacity. Environmental conditions, and not cycling alone, are a key ingredient to longevity, and the worst situation is keeping a fully charged battery at elevated temperatures. This is the case when running a laptop off the power grid. Under these conditions, a battery will typically last for about two years, whether cycled or not. The pack does not die suddenly but will give lower runtimes with aging. I added a Low Voltage Battery Meter. It tells me the voltage of each cell in the battery pack and the total of the whole pack.